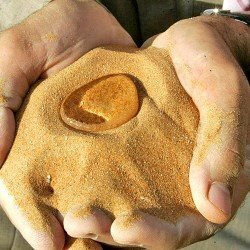 Waterproof sand, also called hydrophobic sand could increase food production as well as put off the coming water wars. The nanotechnology coating is so thin, in fact, that it can’t be seen by the naked eye and measures 12,500 to 13,500 micro millimetres. To date, it’s been approved by the Federal Environment Agency (FEA) in Germany which, according to German scientist Helmut Schulze, has issued a no-objection certificate for the product declaring it as ecologically safe. The sand has been undergoing tests for more than a year; with date palms and grasses, researchers see a 25% increase in the root systems when using hydrophobic sand. Traditional watering of desert plants occurs five or six times per day; use of waterproof sand could reduce this to just one watering, according to researchers. The sand also prevents underground desert salinity from leaching upward. Frank Herbert also had some thoughts about greening the desert; he wrote about chromoplastic dew collectors that could pull moisture from the air for small plants. However, I'm thinking that if you wanted to go to the effort of coating each grain of sand in Dubai with SP-0HFS 1609, you might as well give every grain a 'brain' of nanotransistors as well. Then, we could construct a gigagnostotron like the one described in Stanislaw Lem's 1965 novel The Cyberiad: Fables for the Cybernetic Age. The desert on our planet is in reality no desert, but a Gigagnostotron, in other words a good 10^9 times more powerful than this primitive device of yours. Our ancestors... thought to make the very sand beneath their feet intelligent..."